Fall in love with Tello’s plans and savings. 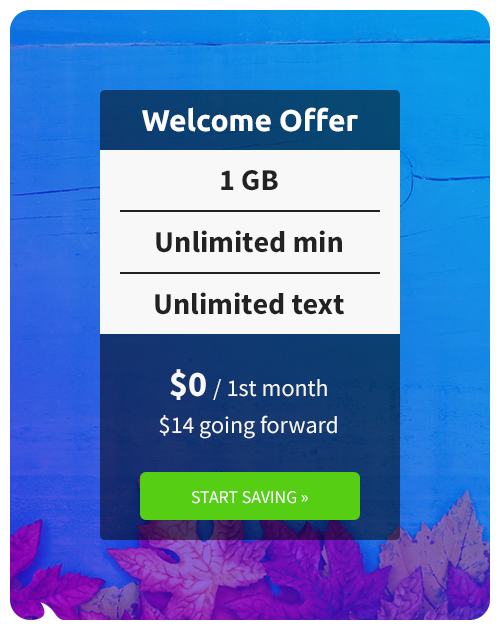 Get 1GB + unlimited talk & text for free! New month. New season. New Beginnings. Who says you have to wait until New Year’s Eve to start a new healthy habit? If savings were always on your list or you are on the fence about switching carriers again, before you lose faith in wireless carriers, take a closer look at Tello Mobile. Our latest promotion enables you to try Tello for FREE for 1 Month, no strings attached. Sign up until September 30, get the $14/mo. Plan and enjoy free cell phone service for 1 month, no coupon needed. Try Tello sitting pretty and say goodbye to contracts or extra fees. No credit checks. No commitment. The Free Starter Plan is the most popular Tello plan since it has a bit of everything, 1GB data, unlimited minutes & text. Plus, all plans come with free tethering. Regular price: $14/month. If you decide the service is a match for your needs and budget, this is what you’re going to pay going forward, after the free first month. Remember that you can always upgrade or downgrade your plan for no extra cost and choose another combination that makes more sense for you or your family. CNET is calling Tello “the champion” when it comes to affordable phone service. It’s time to spread the word about Tello and try it out for yourself. Apart from savings that keep adding up, month over month, existing customers can also benefit from the win-win referral program. Refer a friend to Tello and you both get 10 Tello Dollars. Use them to pay phone bills or even get a new phone.